I’m a world-traveler, writer, and former businessman. I’m also a master chess player, parrot trainer, olive-oil producer, and more – but let’s not go there. After studying Physics at King’s College, London, I worked briefly as a journalist in my birthplace Cyprus, and published a Greek-language magazine called “Introspection.” I then created the first private radio station on the island whilst working in our family-owned media group. I eventually became the COO of the group. In 1999, at the age of 35, I heeded the call of a mid-life crisis and left the business world to retreat to a hillside country house for four years. There, I read books, wrote, and meditated on the meaning of life. For now, I reside in the countryside in a cottage amid orange groves and olive trees, outside the historic seaside town of Nafplio in Greece. Here I mainly read and write. I live with my partner Jane Kayantas, whom I met on the third day of my journey – but let’s not go there. Departing from Europe and following a Westward route, similar to Magellan’s, 2 ½ years later and 27 countries in between, on the 24th of September 2007, I landed on the island of Ternate in the Mollucas – the sought after “Spice Islands”, which Magellan actually failed to reach. Upon arrival, I discovered that, fortuitously, it was not only the month of Ramadan – replete with many local customs – but also the month of the spice harvest! I felt as if the whole universe conspired to make my stay there magical. For an entire week, I delved into the thousand-year-old local Ramadan traditions, and explored Ternate and nearby Tidore, touching, smelling, and taking photographs of the spices, while observing the locals harvesting and drying them. 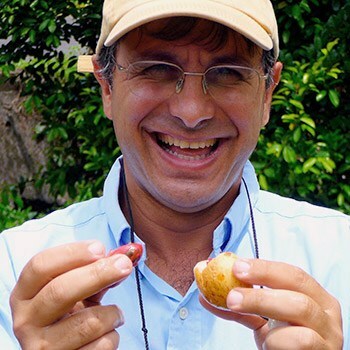 In the photo above, it is more than obvious that I am elated at finally getting my hands on a fresh nutmeg seed, the little object whose quest set off the European Age of Discovery five centuries ago, and finally led to Magellan’s first circumnavigation of the globe. Nutmeg (“pala” in Indonesian) is the brown stone seed of the fruit of the tree “myristica fragrans.” The red lacy seed-covering is the source of a second spice, called mace, from the same fruit. Remarkably, this unique fruit is the only one in Asia that produces two separate famous spices. In the photos below, you can see nicely laid out nutmeg, mace, and clove drying in the sun – the typical sight of all villages in Ternate and Tidore during the spice harvest season.